Byzantine music (Modern Greek: Βυζαντινή μουσική), in a narrow sense, is the music of the Byzantine Empire. Originally it consisted of songs and hymns composed to Greek texts used for courtly ceremonials, during festivals, or as paraliturgical and liturgical music. The ecclesiastical forms of Byzantine music are the best known forms today, because different Orthodox traditions still identify with the heritage of Byzantine music, when their cantors sing monodic chant out of the traditional chant books like sticherarion which in fact consisted of five books, and the heirmologion. Byzantine music did not disappear after the fall of Constantinople. Its traditions continued under the Patriarchate of Constantinople which was annexed by the Islamic Ottoman ruler Sultan Mehmed II in 1453, and granted administrative responsibilities over all Orthodox Christians. During the decline of the Ottoman Empire in the 19th century, burgeoning splinter nations in the Balkans declared autonomy or "autocephaly" against the Ecumenical Patriarchate. The new self-declared patriarchates were independent nations defined by their religion. In this context, Christian religious chant practiced in the Ottoman empire, Bulgaria and Greece among other nations, was based on the historical roots of the art tracing back to the Byzantine Empire, while the music of the Patriarchate created during the Ottoman period was often regarded as "post-Byzantine." This explains why Byzantine music refers to several Orthodox Christian chant traditions of the Mediterranean and of the Caucasus practiced in recent history and even today, and this article cannot be limited to the music culture of the Byzantine past. The tradition of eastern liturgical chant, encompassing the Greek-speaking world, developed in the Byzantine Empire from the establishment of its capital, Constantinople, in 330 until its fall in 1453. It is undeniably of composite origin, drawing on the artistic and technical productions of the classical Greek age and inspired by the monophonic vocal music that evolved in the early Greek Christian cities of Alexandria, Antioch and Ephesus. It was imitated by musicians of the 7th century to create Arab music as a synthesis of Byzantine and Persian music, and these exchanges were continued through the Ottoman Empire until Istanbul today. The term Byzantine music is sometimes associated with the medieval sacred chant of Christian Churches following the Constantinopolitan Rite. There is also an identification of "Byzantine music" with "Eastern Christian liturgical chant," which is due to certain monastic reforms, like the Octoechos reform of the Quinisext Council (692) and the later reforms of the Stoudios Monastery under its abbots Sabas and Theodore. The triodion created during the reform of Theodore was also soon translated into Slavonic which required also the adaption of melodic models to the prosody of the language. Later, after the Patriarchate and Court had returned to Constantinople in 1261, the former cathedral rite was not continued, but replaced by a mixed rite, which used the Byzantine Round notation to integrate the former notations of the former chant books (Papadike). This notation had developed within the book sticherarion created by the Stoudios Monastery, but it was used for the books of the cathedral rites written in a period after the fourth crusade, when the cathedral rite was already abandoned at Constantinople. It is being discussed that in the Narthex of the Hagia Sophia an organ was placed for use in processions of the Emperor’s entourage. According to the chant manual "Hagiopolites," the earliest which has survived until today, chanters of the Hagia Sophia used a system 16 church tones (echoi), while the author of this treatise introduces to a tonal system of 10 echoi. Nevertheless, both schools have in common a set of 4 octaves (protos, devteros, tritos, and tetartos), each of them had a kyrios echos (authentic mode) with the finalis on the degree V of the mode, and a plagios echos (plagal mode) with the final note on the degree I. The resulting eight modes (octoechos) had been identified with the seven tropes (tropoi) of the Ancient Greek harmonikai, the Pythagorean mathematic discipline of music theory as it had been formulated by the harmonikoi during the Hellenic period. Today, chanters of the Christian Orthodox churches identify with the heritage of Byzantine music whose earliest composers are remembered by name since the 5th century, with compositions which are related to them, although it is nearly impossible to reconstruct the original melodies of their hymnodic poems. The melodic neume notation of Byzantine music developed late since the 10th century, with the exception of an earlier ekphonetic notation, interpunction signs used in lectionaries, but modal signatures for the eight echoi can already be found in fragments (papyri) of monastic hymn books (tropologia) dating back to the 6th century. Despite censorship and the decline of knowledge which marks the rise of Christian civilization within Hellenism, certain concepts of knowledge and education did still survive during the imperial age, when Christianity became the official religion. The Pythagorean sect and music as part of the four "cyclical exercises" (ἐγκύκλια μαθήματα) which preceded the Latin quadrivium and science today based on mathematics, established mainly among Greeks in southern Italy (at Taranto and Crotone). Greek anachoretes of the early Middle Ages did still follow this education. The Calabrian Cassiodorus founded Vivarium where he translated Greek texts (science, theology and the Bible), and John of Damascus who learnt Greek from a Calabrian monk Kosmas, a slave in the household of his privileged father at Damascus, mentioned mathematics as part of the speculative philosophy. According to him philosophy was divided into theory (theology, physiology, mathematics) and practice (ethics, economy, politics), and the Pythagorean heritage was part of the former, while only the ethic effects of music were relevant in practice. The mathematic science harmonics was usually not mixed with the concrete topics of a chant manual. It is not evident by the sources, when exactly the position of the minor or half tone moved between the devteros and tritos. It seems that the fixed degrees (hestotes) became part of a new concept of the echos as melodic mode (not simply octave species), after the echoi had been called by the ethnic names of the tropes. The 9th century Persian geographer Ibn Khurradadhbih (d. 911); in his lexicographical discussion of instruments cited the lyra (lūrā) as the typical instrument of the Byzantines along with the urghun (organ), shilyani (probably a type of harp or lyre) and the salandj (probably a bagpipe). The first of these, the early bowed stringed instrument known as the Byzantine lyra, would come to be called the lira da braccio, in Venice, where it is considered by many to have been the predecessor of the contemporary violin, which later flourished there. The bowed "lyra" is still played in former Byzantine regions, where it is known as the Politiki lyra (lit. "lyra of the City" i.e. 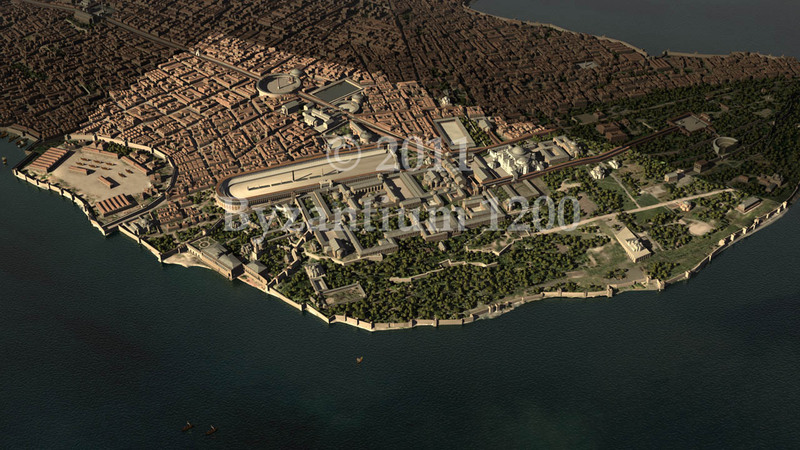 Constantinople) in Greece, the Calabrian lira in Southern Italy, and the Lijerica in Dalmatia. 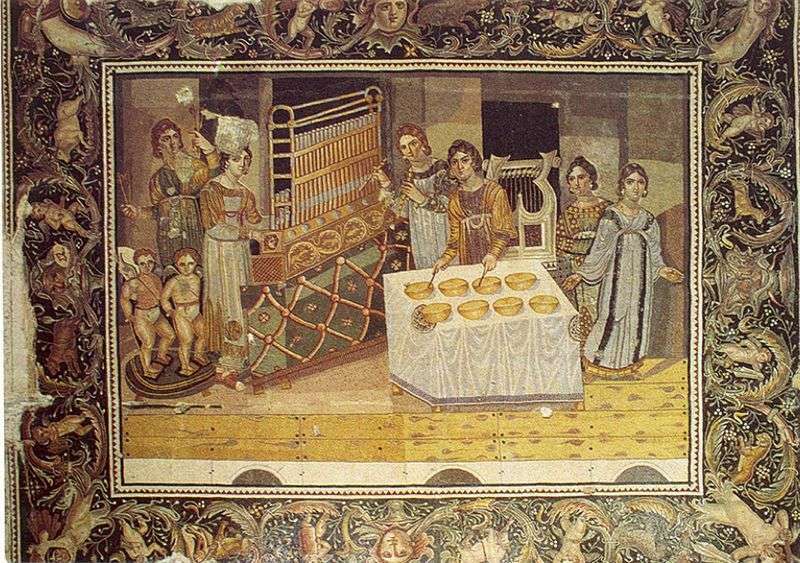 The second instrument, the organ, originated in the Hellenistic world (see Hydraulis) and was used in the Hippodrome in Constantinople during races. A pipe organ with "great leaden pipes" was sent by the emperor Constantine V to Pepin the Short King of the Franks in 757. Pepin's son Charlemagne requested a similar organ for his chapel in Aachen in 812, beginning its establishment in Western church music. Secular music existed and accompanied every aspect of life in the empire, including dramatic productions, pantomime, ballets, banquets, political and pagan festivals, Olympic games, and all ceremonies of the imperial court. It was, however, regarded with contempt, and was frequently denounced as profane and lascivious by some Church Fathers. Claqueurs: Lord, protect the Master of the Romans. Οἱ κράκται· Κύριε, σῶσον τοὺς δεσπότας τῶν Ῥωμαίων. The people: Lord, protect (X3). ὁ λαός ἐκ γ'· Κύριε, σῶσον. Claqueurs: Lord, protect to whom they gave the crown. Οἱ κράκται· Κύριε, σῶσον τοὺς ἐκ σοῦ ἐστεμμένους. Claqueurs: Lord, protect the renewal of the annual cycles. Οἱ κράκται· Κύριε, σῶσον τὴν ἀνακαίνησιν τῶν αἰτησίων. Claqueurs: May the Creator and Master of all things make long your years with the Augustae and the Porphyrogeniti. Οἱ κράκται· Ἀλλ᾽ ὁ πάντων Ποιητὴς καὶ Δεσπότης τοὺς χρόνους ὑμῶν πληθύνει σὺν ταῖς αὐγούσταις καὶ τοῖς πορφυρογεννήτοις. 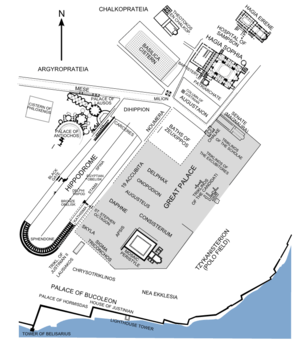 Map of the Great Palace situated between the Hippodrome and the Hagia Sophia. The structures of the Great Palace are shown in their approximate position as derived from literary sources. Surviving structures are in black. These protocols gave rules for imperial progresses to and from certain churches at Constantinople and the imperial palace, with fixed stations and rules for ritual actions and acclamations from specified participants (the text of acclamations and processional troparia or kontakia, but also heirmoi are mentioned), among them also ministers, senate members, leaders of the "Blues" (Venetoi) and the "Greens" (Prasinoi)—chariot teams during the hippodrome's horse races. They had an important role during court ceremonies. The following chapters (84-95) are taken from a 6th-century manual by Peter the Patrician. They rather describe administrative ceremonies like the appointment of certain functionaries (ch. 84,85), investitures of certain offices (86), the reception of ambassadors and the proclamation of the Western Emperor (87,88), the reception of Persian ambassadors (89,90), Anagorevseis of certain Emperors (91-96), the appointment of the senate's proedros (97). The "palace order" did not only prescribe the way of movements (symbolic or real) like on foot, mounted, by boat, but also the costumes of the celebrants and who has to perform certain acclamations. The emperor often plays the role of Christ and the imperial palace is chosen for religious rituals, so that the ceremonial book brings the sacred and the profane together. Book II seems to be less normative and was obviously not compiled from older sources like book I which often mentioned outdated imperial offices and ceremonies, it rather describes particular ceremonies as they had been celebrated during particular imperial receptions during the Macedonian renaissance. Two concepts must be understood to appreciate fully the function of music in Byzantine worship and they were related to a new form of urban monasticism which even formed the representative cathedral rites of the imperial ages which had to baptise many catechumens. The first, which retained currency in Greek theological and mystical speculation until the dissolution of the empire, was the belief in the angelic transmission of sacred chant: the assumption that the early Church united men in the prayer of the angelic choirs. It was partly based on the Hebrew fundament of Christian worship, but in the particular reception of St. Basil of Caesarea's divine liturgy. John Chrysostom, since 397 Archbishop of Constantinople, abridged the long formular of Basil's divine liturgy for the local cathedral rite. The notion of angelic chant is certainly older than the Apocalypse account (Revelation 4:8-11), for the musical function of angels as conceived in the Old Testament is brought out clearly by Isaiah (6:1-4) and Ezekiel (3:12). Most significant in the fact, outlined in Exodus 25, that the pattern for the earthly worship of Israel was derived from heaven. The allusion is perpetuated in the writings of the early Fathers, such as Clement of Rome, Justin Martyr, Ignatius of Antioch, Athenagoras of Athens, John Chrysostom and Pseudo-Dionysius the Areopagite. It receives acknowledgement later in the liturgical treatises of Nicolas Kavasilas and Symeon of Thessaloniki. You must every man of you join in a choir so that being harmonious and in concord and taking the keynote of God in unison, you may sing with one voice through Jesus Christ to the Father, so that He may hear you and through your good deeds recognize that you are parts of His Son. A marked feature of liturgical ceremony was the active part taken by the people in its performance, particularly in the recitation or chanting of hymns, responses and psalms. 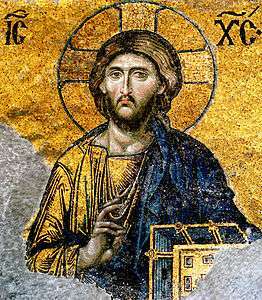 The terms choros, koinonia and ekklesia were used synonymously in the early Byzantine Church. In Psalms 149 and 150, the Septuagint translated the Hebrew word machol (dance) by the Greek word choros Greek: Χορος. As a result, the early Church borrowed this word from classical antiquity as a designation for the congregation, at worship and in song in heaven and on earth both. Concerning the practice of psalm recitation, the recitation by a congregation of educated chanters is already testified by the soloistic recitation of abridged psalms by the end of the 4th century. Later it was called prokeimenon. Hence, there was an early practice of simple psalmody which was used for the recitation of canticles and the psalter, and usually Byzantine psalters have the 15 canticles in an appendix, but the simple psalmody itself was not notated before the 13th century, in dialogue or papadikai treatises preceding the book sticheraria. Later books like the akolouthiai and some psaltika also contain the elaborated psalmody, when a protopsaltes recited just one or two psalm verses. Between the recited psalms and canticles troparia were recited according to the same more or less elaborated psalmody. This context relates antiphonal chant genres like antiphona (kind of introits), trisagion and its substitutes, prokeimenon, allelouiarion, the later cherubikon and its substitutes, the koinonikon cycles as they were created during the 9th century. In most of the cases they were simply troparia and their repetitions or segments were given by the antiphonon, whether it was sung or not, its three sections of the psalmodic recitation were separated by the troparion. The fashion in all cathedral rites of the Mediterranean was a new emphasis on the psalter. In older ceremonies before Christianity became the religion of empires, the recitation of the biblical odes (mainly taken from the Old Testament) was much more important. They did not disappear in certain cathedral rites, like the Milanese and the Constantinopolitan rite. Before long, however, a clericalizing tendency soon began to manifest itself in linguistic usage, particularly after the Council of Laodicea, whose fifteenth Canon permitted only the canonical psaltai, "chanters," to sing at the services. The word choros came to refer to the special priestly function in the liturgy - just as, architecturally speaking, the choir became a reserved area near the sanctuary - and choros eventually became the equivalent of the word kleros (the pulpits of two or even five choirs). Ps. 17 with troparia Ἀλληλούϊα and Μνήσθητί μου, κύριε. (1) with troparion Tῷ κυρίῳ ἄισωμεν, ἐνδόξως γὰρ δεδόξασται. (4) & (6) with troparion Οἰκτείρησόν με, κύριε. (3) & (9a) with troparion Ἐλέησόν με, κύριε. (5) & Mannaseh (apokr. 2 Chr 33) with troparion Ἰλάσθητί μοι, κύριε. (7) which has a refrain in itself. The common term for a short hymn of one stanza, or one of a series of stanzas, is troparion. As a refrain interpolated between psalm verses it had the same function like the antiphon in Western plainchant. The simplest troparion was probably "allelouia", and similar to troparia like the trisagion or the cherubikon or the koinonika a lot of troparia became a chant genre of their own. A famous example, whose existence is attested as early as the 4th century, is the Easter Vespers hymn, Phos Hilaron ("O Resplendent Light"). Perhaps the earliest set of troparia of known authorship are those of the monk Auxentios (first half of the 5th century), attested in his biography but not preserved in any later Byzantine order of service. Another, O Monogenes Yios ("Only Begotten Son"), ascribed to the emperor Justinian I (527-565), followed the doxology of the second antiphonon at the beginning of the Divine Liturgy. 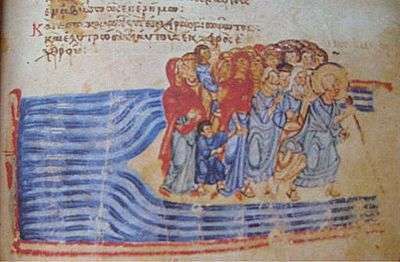 The development of large scale hymnographic forms begins in the fifth century with the rise of the kontakion, a long and elaborate metrical sermon, reputedly of Syriac origin, which finds its acme in the work of St. Romanos the Melodist (6th century). This dramatic homily, which usually paraphrases a Biblical narrative, comprises some 20 to 30 stanzas (oikoi "houses") and was sung during the Morning Office (Orthros) in a simple and direct syllabic style (one note per syllable). The earliest musical versions in Italobyzantine kontakaria of the thirteenth century, however, are melismatic (that is, many notes per syllable of text), and were probably sung since the ninth century, when kontakia were reduced to the prooimion (introductory verse) and first oikos (stanza). Romanos' own recitation of all the numerous oikoi must have been much simpler, but the most interesting question of the genre are the different functions that kontakia once had. According to Johannes Koder the kontakion was celebrated the first time during Lenten period in 537, about ten months before the official inauguration of the new built Hagia Sophia on 27 December. During the second half of the sixth century, there was a change in Byzantine sacred architecture, because the altar used for the preparation of the eucharist had been removed from the choir. It was placed in a separated room called "prothesis" (πρόθεσις). The separation of the prothesis where the bread was consecrated during a separated service called proskomide, required a procession of the gifts at the beginning of the second eucharist part of the divine liturgy. The troparion "Οἱ τὰ χερουβὶμ" which was sung during the procession, was often ascribed to Emperor Justin II, but the changes in sacred architecture were definitely traced back to his time by archaeologists. Concerning the Hagia Sophia which was constructed earlier, the procession was obviously within the church. It seems that the cherubikon was a prototype of the Western chant genre offertory. When they sing Lauds at Hagia Sophia, they sing first in the narthex before the royal doors; then they enter to sing in the middle of the church; then the gates of Paradise are opened and they sing a third time before the altar. On Sundays and feastdays the Patriarch assists at Lauds and at the Liturgy; at this time he blesses the singers from gallery, and ceasing to sing, they proclaim the polychronia; then they begin to sing again as harmoniously and as sweetly as the angels, and they sing in this fashion until the Liturgy. After Lauds they put off their vestments and go out to receive the blessing of the Patriarch; then the preliminary lessons are read in the ambo; when these are over the Liturgy begins, and at the end of the service the chief priest recites the so-called prayer of the ambo within the sanctuary while the second priest recites in the church, beyond the ambo; when they have finished the prayer, both bless the people. Vespers are said in the same fashion, beginning at an early hour. By the end of the seventh century with the reform of 692, the kontakion, Romanos' genre which more or less replaced the former canticle recitation, was overshadowed by a certain monastic type of homiletic hymn, the kanon. Essentially, the kanon is an hymnodic complex composed of nine odes which were originally attached to the nine Biblical canticles and to which they were related by means of corresponding poetic allusion or textual quotation (see the section about the biblical odes). Out of the custom of canticle recitation, monastic reformers at Constantinople, Jerusalem and Mount Sinai developed a new homiletic genre whose verses in the complex ode meter were composed over a melodic model: the heirmos. The nine odes of the kanon were dissimilar by their metrum. Consequently, an entire heirmos comprises nine independent melodies (eight, because the second ode was usually omitted outside Lenten period), which are united musically by the same echos and its melos, and sometimes even textually by references to the general theme of the liturgical occasion—especially in acrosticha composed over a given heirmos, but dedicated to a particular day of the menaion. 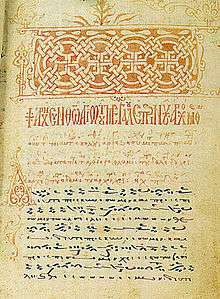 The earliest examples were composed during the 6th century under Sophronius, Patriarch of Jerusalem, they have mainly survived in the Georgian tropologion called "Iadgari", although this collection favours compositions made in Constantinople. After the octoechos reform of the Quinisext Council in 692, monks at Mar Saba continued the hymn project under Andrew of Crete (ca. 660-ca. 714), like John of Damascus and Cosmas of Jerusalem. Today the second ode is always omitted (according to the so-called "golden canon" attributed to John of Damascus), but medieval heirmologia rather testify the custom, that the extremely strict spirit of Moses' last prayer was recited during Lenten period, when the number of odes was limited. During the 9th-century reforms of the Stoudios Monastery, the reformers favoured Palestinian composers in their new notated chant books heirmologion and sticherarion. Festal stichera, accompanying both the fixed psalms at the beginning and end of Hesperinos and the psalmody of the Orthros (the Ainoi) in the Morning Office, exist for all special days of the year, the Sundays and weekdays of Lent, and for the recurrent cycle of eight weeks in the order of the modes beginning with Easter. Their melodies were originally preserved in the tropologion. 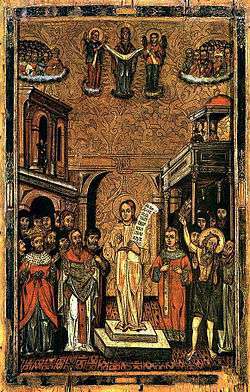 During the 10th century two new notated chant book were created at the Stoudios Monastery which were supposed to replace the tropologion: the sticherarion, consisting of the idiomela in the menaion (the fixed cycle between September and August), the triodion and the pentekostarion (mobile cycle around the holy week), and the octoechos (hymns of the weekly cycle), a bulky volume which first appeared in the middle of the tenth century and contains over a thousand model troparia (prosomoia), and the heirmologion which was either composed according to the eight echoi or according to the nine odes of the canon. These books were not only provided with musical notation, with respect to the former tropologia they were also considerably more elaborated and varied as a collection of various local traditions. In practice it meant that only a small part of the repertory was really chosen to be sung during the divine services. The new custom established by the reformer was that each ode consists of an initial troparion, the heirmos, followed by three, four or more troparia from the menaion which are the exact metrical reproductions of the heirmos (akrostics), thereby allowing the same music to fit all troparia equally well. Byzantine chant manuscripts date from the 9th century, while lectionaries of biblical readings in ekphonetic notation (a primitive graphic system designed to indicate the manner of reciting lessons from Scripture) begin about a century earlier and continue in use until the 12th or 13th century. Our knowledge of the older period is derived from Church service books Typika, patristic writings and medieval histories. Scattered examples of hymn texts from the early centuries of Greek Christianity still exist. Some of these employ the metrical schemes of classical Greek poetry; but the change of pronunciation had rendered those meters largely meaningless, and, except when classical forms were imitated, Byzantine hymns of the following centuries are prose-poetry, unrhymed verses of irregular length and accentual patterns. The effect that this concept had on church music was threefold: first, it bred a highly conservative attitude to musical composition; secondly, it stabilized the melodic tradition of certain hymns; and thirdly, it continued, for a time, the anonymity of the composer. For if a chant is of heavenly origin, then the acknowledgment received by man in transmitting it to posterity ought to be minimal. This is especially true when he deals with hymns which were known to have been first sung by angelic choirs - such as the Amen, Alleluia, Trisagion, Sanctus and Doxology. Consequently, until Palaeologan times, it was inconceivable for a composer to place his name beside a notated text in the manuscripts. The earliest chant manual pretends right at the beginning that John of Damascus was its author. Its first edition was based on a more or less complete version in a 14th-century manuscript, but the treatise was probably created centuries earlier as part of the reform redaction of the tropologia by the end of the 8th century, after Irene's Council of Nikaia had confirmed the octoechos reform of 692 in 787. It fits well to the later focus on Palestine authors in the new chant book heirmologion. Concerning the octoechos, the Hagiopolitan system is characterised as a system of eight diatonic echoi with two additional phthorai, which were not used by John of Damascus, but by Joseph the Hymnographer. It also mentions an alternative system of the Asma (the cathedral rite was called ἀκολουθία ᾀσματική) which consisted of 4 kyrioi echoi, 4 plagioi, 4 mesoi, and 4 phthorai. It seems that until the time, when the Hagiopolites was written, the octoechos reform did not work out for the cathedral rite, because singers at the court and at the Patrairchate still used a tonal system of 16 echoi which was obviously part of the particular notation of their books: the asmatikon and the kontakarion or psaltikon. But neither 9th-century Constantinopolitan chant book nor an introducing treatise which explains the fore-mentioned system of the Asma, have survived. Only a 14th-century manuscript of Kastoria testifies cheironomic signs used in the Kontakarion which are transcribed in longer melodic phrases by the notation of the contemporary sticherarion, the middle Byzantine Round notation. With the end of creative poetical composition, Byzantine chant entered its final period, devoted largely to the production of more elaborate musical settings of the traditional texts: either embellishments of the earlier simpler melodies, or original music in highly ornamental style. This was the work of the so-called Maïstores, “masters,” of whom the most celebrated was St. John Koukouzeles (active c. 1300), compared in Byzantine writings to St. John of Damascus himself, as an innovator in the development of chant. The multiplication of new settings and elaborations of the old continued in the centuries following the fall of Constantinople, until by the end of the eighteenth century the original musical repertory of the medieval musical manuscripts had been quite replaced by later compositions, and even the basic model system had undergone profound modification. To a certain degree there may be found remnants of Byzantine or early (Greek-speaking, Orthodox Christian) near eastern music in the music of the Ottoman Court. Examples such as that of the composer and theorist Prince Cantemir of Romania learning music from the Greek musician Angelos, indicate the continuing participation of Greek speaking people in court culture. The influences of ancient Greek basin and the Greek Christian chants in the Byzantine music as origin, are confirmed. Music of Turkey was influenced by Byzantine music, too (mainly in the years 1640-1712). Ottoman music is a synthesis, carrying the culture of Greek and Armenian Christian chant. It emerged as the result of a sharing process between the many civilizations which met together in the Orient, considering the breadth and length of duration of these empires and the great number of ethnicities and major or minor cultures that they encompassed or came in touch with at each stage of their development. Chrysanthos of Madytos (ca. 1770-1846), Gregory the Protopsaltes (ca. 1778 - ca. 1821), and Chourmouzios the Archivist were responsible for a reform of the notation of Greek ecclesiastical music. Essentially, this work consisted of a simplification of the Byzantine musical symbols which, by the early 19th century, had become so complex and technical that only highly skilled chanters were able to interpret them correctly. The work of the three reformers is a landmark in the history of Greek Church music, since it introduced the system of neo-Byzantine music upon which are based the present-day chants of the Greek Orthodox Church. Unfortunately, their work has since been misinterpreted often, and much of the oral tradition has been lost. Simon Karas (1905–1999) began an effort to assemble as much material as possible in order to restore the apparently lost tradition. His work was continued by Lycourgos Angelopoulos and other psaltai (“cantors”) of Byzantine music, untill his death 18 May 2014. Two major styles of interpretation have evolved, the Hagioritic, which is simpler and is mainly followed in monasteries, and the Patriarchal, as exemplified by the style taught at the Great Church of Constantinople, which is more elaborate and is practised in parish churches. Nowadays the Orthodox churches maintain chanting schools in which new cantors are trained. Each diocese employs a protopsaltes (“first cantor”), who directs the diocesan cathedral choir and supervises musical education and performance. The protopsaltes of the Patriarchates are given the title Archon Protopsaltes (“Lord First Cantor”), a title also conferred as an honorific to distinguished cantors and scholars of Byzantine music. Jessica Suchy-Pilalis is an example of a modern composer who writes and arranges sacred music in the Byzantine tradition. Dr. Suchy-Pilalis serves as Protopsaltes at Holy Trinity Greek Orthodox Church in Indianapolis, Indiana. ↑ Neubauer, Eckhard (1994). "Die acht "Wege" der arabischen Musiklehre und der Oktoechos – Ibn Misğah, al-Kindī und der syrisch-byzantinische oktōēchos". Zeitschrift für Geschichte der arabisch-islamischen Wissenschaften. 9: 373–414. ↑ The acts of the Quinisext Council condemned many Constantinopolitan customs, including certain phthorai and mesoi used by chanters of the cathedral rite. The Stoudites reforms were influenced by the Second Council of Nicaea (787), which confirmed the Octoechos reform for Eastern and Western chant. The typikon of Theodore has not survived, but it must have adopted Hagiopolitan customs of Mar Saba. ↑ Troelsgård, Christian (2007). "A New Source for the Early Octoechos? Papyrus Vindobonensis G 19.934 and its musical implications". Proceedings of the 1st International Conference of the ASBMH (PDF). pp. 668–679. Retrieved 14 April 2012. ↑ Constantelos, Demetrios (1998). "The Formation of the Hellenic Christian Mind". Christian Hellenism. Essays and Studies in Continuity and Change. New Rochelle, New York & Athens: Caratzas. ISBN 0-89241-588-6. ↑ John of Damascus (1958). Πηγή Γνώσεως. New York. p. 12. ↑ PG 94, col. 533. ↑ Ptolemy's harmonics are the concluding main reference in didactic writings of Georgius Pachymeres and Manuel Bryennios, except the Aristoxenian fragments, and later authors like Nichomachus, Cleonides, Theon of Smyrna, and Aristides Quintilianus (2nd-4th century). All Byzantine authors teach harmonics as a mathematic science without any concern over contemporary composition. Wolfram, Gerda (2001). "Fragen der Kontinuität zwischen antiker und byzantinischer Musiktheorie" (PDF). Cantus Planus: Papers read at the ninth meeting. Budapest: Magyar Tudomanyos Akademia. pp. 575–584. ↑ Howard, Albert A. (1893). "The Αὐλός or Tibia". Harvard Studies in Classical Philology. Department of the Classics, Harvard University. 4: 1–60. doi:10.2307/310399. ↑ Canon 62 of the Quinisext Synod (692) banned certain "pagan" feast of the hippodrome like Vota and Broumalia. Nevertheless, both feasts were still described in Constantine VII Books of ceremonies (I:72 & II:18). ↑ Τὸν Δεσπότην or Εἰς πολλἀ ἔτη, Δέσποτα. are two of the very few acclamations which are still in use today during the veneration of the icons by a Metropolit or the appointment of such an office. ↑ These formulas are documented in various regions of the Mediterranean like the Gallican and Visigothic preces, the terkyrie of the Ambrosian rite, but also in coronation rites which were even performed at Montecassino Abbey, when Pope Nicholas II accepted the Normans as allies. ↑ Constantine VII: Ἔκθεσις τῆς Βασιλείου τάξεως, PG 112, col. 664 (book I, ch. 73). ↑ A reprint of Johann Jakob Reiske's first edition can be found in PG (CXII, cc. 73-1416). For an English translation of this edition see: Constantine VII Porphyrogennetos (2012). The book of ceremonies in 2 volumes. Byzantina Australiensia. Ann Moffatt (ed.) (Repr. Bonn 1829 ed.). Canberra: Australian Association for Byzantine Studies. ISBN 1876503424. ↑ For a discussion of the ceremonial book's composition, but also on details of certain ceremonies, see: Bury, John Bagnell (1907). "The Ceremonial Book of Constantine Porphyrogennetos". The English Historical Review. 22: 209–227;426–448. doi:10.1093/ehr/xxii.lxxxvi.209. ↑ PG 112, col. 216f (ch. 3). ↑ The hippodrome was as important for court ceremonies as the Hagia Sophia for imperial religious ceremonies and rites of passage. It was not only used during horse races, but also for receptions and its banquets and the yearly celebration of Constantinople's inauguration on 11 May. The "Golden Hippodrome" was an own ceremony to inaugurate a new season and to fix the calendar of the ceremonial located in the hippodrome. Occasionally also votive horse races were given, like on 22 July for the feast of Saint Elias. Woodrow, Zoe Antonia (2001). "Imperial Ideology in Middle Byzantine Court Culture: The Evidence of Constantine Porphyrogenitus's 'De ceremoniis'". Durham University. ↑ Patrologia Graeca, CL, 368-492 and CLV, 536-699, respectively. ↑ Troelsgård, Christian. "Psalm, § III Byzantine Psalmody". Grove Music Online. Retrieved 20 April 2012. ↑ Strunk, William Oliver (1956). "The Byzantine Office at Hagia Sophia". Dumbarton Oaks Papers. 9/10: 175–202. JSTOR 1291096. ↑ See the edition of the simple models in the habilitation of Constantin Floros which has been republished recently. Floros, Constantin (2015). Das mittelbyzantinische Kontaktienrepertoire. Untersuchungen und kritische Edition. Hamburg. Floros, Constantin (2009). The Origins of Russian Music: Introduction to the Kondakarian Notation. Frankfurt am Main: Peter Lang. ISBN 9783631595534. ↑ In his comparartive study of kontakarion manuscripts, Christian Thodberg made a typological distinction between the short and the long kontakarion. Thodberg, Christian (1966). Der byzantinische Alleluiarionzyklus: Studien im kurzen Psaltikonstil. Monumenta musicae Byzantinae - Subsidia. 8. Holger Hamann (trans.). Kopenhagen: E. Munksgaard. ↑ Justinian had finally decided to face the upriots, but he could probably foresee that it would end in massacres. The violent destruction and fire raising at buildings in the quarter which was the administrative residence of the whole empire, had already happened during an earlier civil war, which followed the death of Archbishop John Chrysostom during his last exile. ↑ Koder, Johannes (2008). "Imperial Propaganda in the Kontakia of Romanos the Melode". Dumbarton Oaks Papers. 62: 275–291; 281. ISSN 0070-7546. JSTOR 20788050. ↑ See the marble screen of Veliko Tarnovo which is close to the reconstruction based on a marble fragment of the 6th century. Tschilingirov, Assen (1978). Die Kunst des christlichen Mittelalters in Bulgarien. Berlin: Union. p. 18. ↑ Neil Moran offers a discussion of different hypotheses concerning the exact way of the procession. He also regards a central ambo, positioned slightly eastwards before the choir screen, as the regular place of the chanters since the 5th century. Since Justinian two choirs have had to be limited to 12 singers each. Moran, Neil (1979). "The Musical 'Gestaltung' of the Great Entrance Ceremony in the 12th century in accordance with the Rite of Hagia Sophia". Jahrbuch der Österreichischen Byzantinistik. 28: 167–193. ↑ The old term of the pre-Carolingian Gallican rite was "sonus." Since Abbot Hilduin at the Abbey Saint Denis, a diplomate at the Court of Louis the Pious, the cherubikon was re-introduced within the so-called Missa greca in honour of the patron who became identified with the Greek father Pseudo-Dionysius. The chant books of the abbey also provide the cherubikon as the offertory chant for the Pentecost Mass. ↑ Neil Moran (1979) interpreted the four antiphona which interrupted the cherubikon in the Italobyzantine psaltikon Cod. mess. 161 (I-ME, Fondo SS. Salvatore, Ms. gr. 161 ff.71-74), as of Constantinopolitan origin. According to him the dramaturgy of the doors were not those of the choir screen, but of an elliptic ambo under the dome of the Hagia Sophia. ↑ Quoted according to the translation by Oliver Strunk (1956, 177). ↑ Frøyshov, Stig Simeon R. (2007). "The Early Development of the Liturgical Eight-Mode System in Jerusalem" (PDF). Saint Vladimir's Theological Quarterly. 51: 139–178. Retrieved 20 April 2012. ↑ The menaion had in early sticheraria until the 12th century a larger repertoire, but until the 14th century the repertory of notated idiomela was reduced to a collection of 750. Only a part was performed within a local monastic tradition throughout the year. ↑ "The Byzantine music and notation system" according to the Institute for Research on Music and Acoustics. ↑ Raasted, Jørgen, ed. (1983). The Hagiopolites: A Byzantine Treatise on Musical Theory. Cahiers de l'Institut du Moyen-Âge Grec et Latin. 45. Copenhagen: Paludan. ↑ "Dr. Jessica Suchy-Pilalis, Research Specialty: Byzantine Chant". Retrieved 10 February 2012. Wikimedia Commons has media related to Category:Byzantine music. Wikimedia Commons has media related to Chrysanthos of Madytos. Troelsgård, Christian (ed.). "Monumenta Musicae Byzantinae". University of Copenhagen, Saxo Institute, Dept. of Greek and Latin. "A Handbook on Theoretical and Practical Music" from 1825 (handwritten copy of Chrysanthos' Mega Theoretikon, first volume, by Basileios Nikolaḯdes Byzantios). Conomos, Dimitri E. "A Brief Survey of the History of Byzantine and Post-Byzantine Chant". Text reproduced with permission from Dr. Conomos' text at the website of the Greek Orthodox Archdiocese of America. An example of Byzantine chant.